Did you study SSLC in P.S.High School, Mylapore, Chennai 600 004 in 1961? If your answer is YES, you will be happy to know that GOLDEN JUBILEE REUNION OF THE CLASS OF 1961 of PSHS will be held on Sunday, the 30th January 2011 (Sunday). It is a unique occasion for us to meet our old classmates, recall the wonderful time that we spent in the school and rekindle our association with the school. 1. Honouring with a Shawl/Dhoti & towel and a Cash Award of Rs. 5000/- each to all those who were teachers in P.S.High School on 31-03-1961 and who are still alive. The budget for this item was expected to be Rs. 70,000/-, but will go up to about Rs. 80,000/- as there are 13 teachers and two non-teaching staff who are alive. 3. 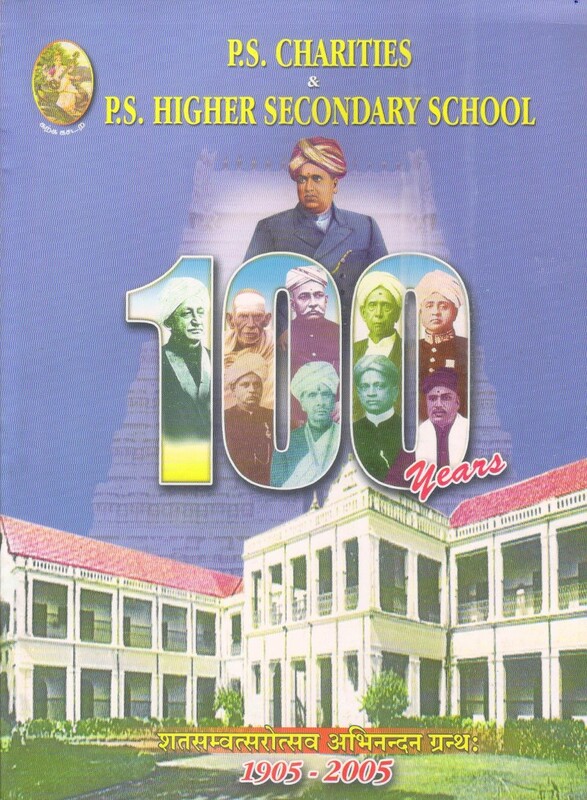 To bring out a book (Souvenir) containing articles on the school, the teachers as well as 1961 batch. The budget for this item was Rs. 10,000/-, but will go up as we want to include photographs of teachers as well as the students. 5. Making a suitable endowment to the school from the batch of 1961 as a remembrance. It was decided that each of us will contribute Rs. 5,000 (Rupees Five Thousand only). 21 persons (Satish Bantwal, Myself, R.Jayaraman, C.Kailasam, V.Srinivasan, T.K.Varadarajan, K.S.Seetharaman, R.K.Sridharan, V.Desikan, E.R.Lakshmanan, S.Balachander, R.Dhanagopal, E.B.Satyanarayanan, S.Sivaraj, M.Rajkumar, S.Ramani, D.Krishnaswami, A.R.Karthigeyan, S.Kapaleeswaran, S.G.Balakrishnan and M.R.Ramakrishnan - Rs. 5000/- each and Rs. 2500/- by R.Kasi) have already made their contributions. Depending on the amount collected, item 5 above will be decided. Whatever is left over after meeting the expenses will be donated to the school in the form of a suitable equipment for use. Out of the 13 teachers who were in service in March 1961 and who are now alive, we have called on 11 retired teachers and personally invited them for the function on 30-01-2011. (Balachander, Seetharaman and I met S/Shri Sanjeevi, Venkataraman and Ranganathan : Balachander, Seetharaman, Sridharan, Jayaraman and I met S/Shri Sakthi Kumar, Vijayaraghavan, Krishnamurthy and J.S.Krishna : Balachander, Jayaraman and I met S/Shri Meenakshi Sundaram, Sankaran, Natarajan and Ramasubban). As Shri Vijayaraghavan and Shri Ramasubban will not be attending the function, they have been honoured with shawl and Rs. 5000/- in their homes. Shri K.S.Manickaratnam is away in USA and Shri P.S.Ramachandra Iyer’s address could not be obtained. Balachander has also invited on phone Mr. Ramamurthy and Mr.Srinivasaraghavan , non-teaching staff who were in service in March 1961. - Be available in Chennai for the Re-unioon to be held in P.S.High School on 30-01-2011 (Sunday) and attend the same. Please report at 3.30 P.M.
- Attend the next meeting in the school ppremises at 4.15 P.M. on 9-1-2011 (Sunday). - Contribute Rs. 5,000/- or more (or lesss) as your share of the expenditure by cash or a crossed cheque in favour of S.Parthasarathy. - Write article/anecdote on your days in the school and send the same by email to me at spchennai@gmail.com before 5-1-2011 as the souvenir will be given for printing on 6th Jan. Desikan, Rajkumar, Seetharaman, Sridharan, Srinivasan, Varadarajan and I have already penned our thoughts. - Please fill the enclosed biodata formatt (if you have not already done it) and send it by email to me. I have already obtained the Biodata of those who attended the meeting on 26th December 2010. - Please send a photograph of yours by emmail to me. I have already taken a photo of those who attended the meeting on 26th December 2010. Click here for downloading the biodata format. Please download the same, fill it up and send it by email. Click here for downloading the appeal for advertisements for the Souvenir.